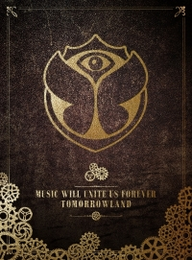 In celebration of Tomorrowland's 10 year anniversary a unique compilation album titled 'Music Will Unite Us Forever - 10 Years of Madness' will be released this summer. Due for UK release on the 29th September, this 3 CD compilation combines exclusive mixes from some of the world's best known DJ’s along with 20 festival anthems from across the past 10 years. The 6 featured DJ mixes are from: Afrojack; Armin van Buuren; Dimitri Vegas and Like Mike; Hardwell; Steve Aoki and Yves V. The other 20 tracks were chosen by the People of Tomorrow themselves. With 3 full CDs, deluxe packaging and a casebound photo booklet covering the festival since its launch in 2005. Now all the People of Tomorrow can be part of the experience. This year, Tomorrowland also celebrated its 10th anniversary with a double festival. All 360,000 tickets for the anniversary edition were sold out in less than an hour. The interest from across the globe was overwhelming and all 360,000 tickets for the anniversary edition sold out in less than an hour. People from all over the world visited the festival across two weekends. Attendees witnessed performances from some of the world’s biggest DJ’s on the stages of Tomorrowland 2014. Artists featured included Tiësto, David Guetta, Paul Oakenfold, Steve Angello, Maceo Plex, Avicii, Carl Cox, Knife Party, Seth Troxler, Paul Kalkbrenner, Eric Prydz amongst many more. Also appearing at this year’s festival were headliners Afrojack, Armin van Buuren, Hardwell, Steve Aoki, Yves V and “Kings of Tomorrowland” Dimitri Vegas & Like Mike, who each delivered an exclusive mix for the special edition album to mark the Belgian festival’s 10th year.